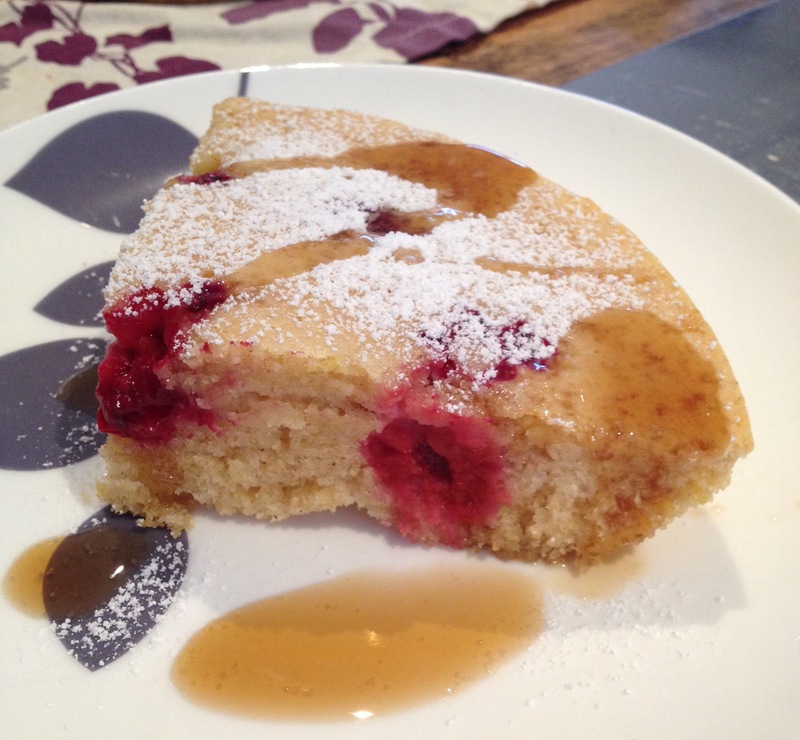 Baked Berry Pancake | sweet ravioli! If you’ve been a follower of mine for a while you’ll know I have a love/hate relationship with pancakes. I love eating them but I’ve always had trouble cooking them! I’ve tried many recipes over the years and I’ve never been completely satisfied with how they turn out. Basically they’ve never lived up to my mum’s, or those I’ve had at a cafe. I’ve come to the conclusion that I’m probably likely very impatient. I have my gas up too high, thinking they’ll cook quicker, when all that happens is that they brown too quickly on the outside and end up mushy in the middle. To combat my hastiness I now bake a huge pancake in my frypan (skillet). The great thing is that I don’t have to stand at the stove flipping pancakes! Another bonus is that you could try almost any pancake recipe for this baked version. Try experimenting with different flours and add-ins like banana or chocolate chips. My guess is that you’ll get the lightest and most fluffiest cake if you use wheat flour. Preheat the oven to 180 degrees celcius. Place a 8.5 inch frypan or skillet in your oven to heat up (you could use a bigger frypan, your pancake will just be flatter and less ‘cake’ like). In a large bowl whisk together the flours, the sugar, baking powder and salt. In a small jug combine the milk, vanilla, egg and the melted butter. Whisk the wet ingredients into the dry until just combined. Being extra careful not to burn yourself (God knows I have!) remove the pan from the oven and pop in the tablespoon of butter, swirling to as it melts. Pour in the pancake batter and then scatter the berries over the top. Place back in the oven carefully and bake for about 25 minutes or until a knife pierced in the centre comes out clean. Cool for 5 minutes before slicing into wedges and plating up. If you want to be fancy, dust each slice with some icing sugar and drizzle with maple syrup.